Rainbird Software has released the long-awaited sequel to Starglider. Starglider II ($44.95 list) combines state-of-the-art graphics, sound and animation special effects into a fast-paced new game for the ST. In the new version, players pilot a futuristic spaceship through an alien desert in an effort to rescue alliance colonies under Egron attack. The Starglider vehicle is equipped with all the latest weapons to assist you in your mission: laser cannons, smart bombs and highly sensitive motion controllers. 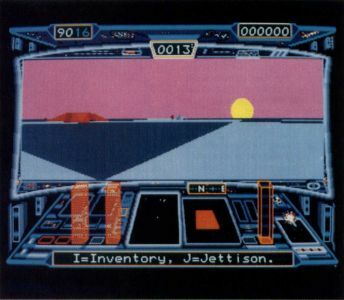 During play, an alien desert is seen through the cockpit viewer, with the terrain appearing as solid three-dimensional objects on your ST's color monitor. The three-dimensional effect is convincing and shows some ingenious programming. Starglider II is the first program released from Rainbird that runs on both an Amiga and Atari ST from one disk. Rainbird has re-released the original Starglider game with a lower price and new packaging.